Early 19th century map of the Americas. 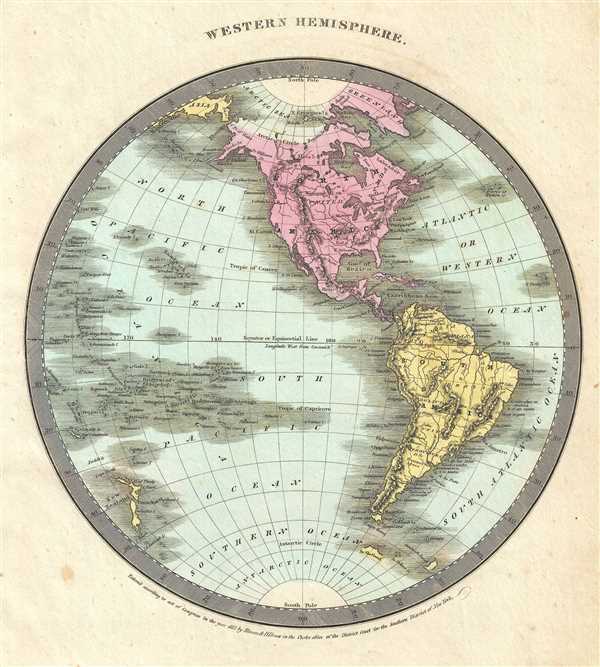 This is an attractive first edition 1835 David Burr map of the Western Hemisphere By David Burr. It covers North America, South America, West Indies and most of Polynesia including New Zealand and offers a fascinating snapshot of the world during a period of rapid globalization and discovery. Important cities, rivers, islands and mountains, along with other topographical features are noted throughout. The Antarctic continent, first sighted in 1820, but neglected during the first half of the 19th century, does not appear on the map. According to Ristow, although Burr is credited on the title page, he left this atlas incomplete. He was appointed as topographer to the U.S. Post Office, and of the sixty-three maps finally included in this atlas, only completed eight. The rest of the maps were then completed by Illman and Pilbrow in Burr's style. The map was ‘Entered according to act of Congress in the year 1833 by Illman & Pilbrow in the Clerk’s office of the District Court for the Southern District of New York’. Published by D. S. Stone in Burr’s New Universal Atlas. Rumsey 4628.002. Philips (Atlases) 771.